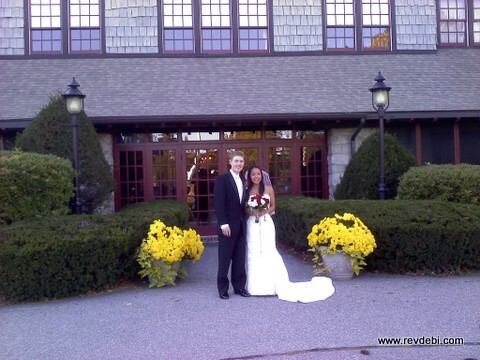 This wedding was at the Vesper Country Club in Tyngsboro, MA. Such a pleasant couple to work with, I enjoyed all our interactions. We performed an intimate feeling ceremony even though it was in front of a room full of people, somehow the couple’s love for each other made it seem so much more of a private sharing of vows. I do have to give a shout out to the Flower Girl and the Ring Bearer, who performed their tasks with dignity and happiness. As a nod to the Bride’s Viet culture, we did include a tiny handfasting ceremony, tying the couples hands with a red cord, upon which I had first knotted a celtic style infinity knot, and then added silver beads [Pandora style] which featured a Sun just under the knot with a Moon and a Star at the two ends of the cord. A simple blessing was said over the hands after the cord was knotted. I liked that a lot!